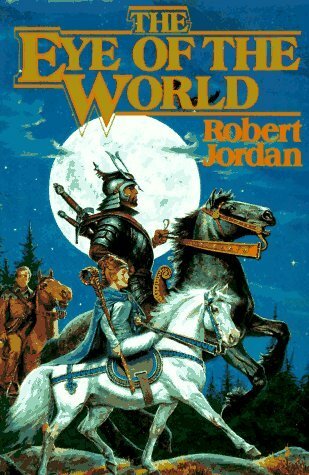 The Eye of the World is book one of the thirteen-book Wheel of Time series. I bought this book over a year ago and it took me a long time to start reading it. I began the book, telling myself that I could stop at any time and abandon not only book one, but the idea of reading the whole series. The middle of the book is repetitive to the point of tedious, where (of course) the fleeing group gets separated into smaller groups. The story mainly follows Rand and Mat, who get attacked by Darkfriends in various guises in every stop they make. My other major qualm with the writing is the golly-shucks-hayseed innocence to the interior monologue of some of the characters, notably, Rand, Perrin, and Egwene. Greater character development would make them feel less wooden. They’re young adults, though they think like children. Sometimes this book felt like a YA novel. The action in this book hooked me enough to read to the end. I enjoyed learning about the world and about the various inhabitants, dark forces, and magical beings enough to start book two: The Great Hunt . Two hundred pages in, it’s moving slowly as well. Will I read book three? The jury is out.